Senalli� was one of the Trojan Horses who infiltrated the Italian Violin School into the melodically enchanting Parisian music houses. Other composers who shared his taste for the virtuosically challenging, such as Leclair and Francoeur, have been well represented on disc � the former certainly, the latter maybe less so � but Senalli� is another matter. For years his works were not represented at all on disc. Back in the days of 78 the only way to get Senalli� was to submit to the indignity of transposition and arrangement. There were no violin recordings in the 78 age to my knowledge, only cello arrangements. If you fancied a few minutes with him you needed to cosy up to W.H. Squire or Cedric Sharpe � British cellists were especially fond of these works � or if you really wanted to fly the kite Archie Camden served up something on his bassoon. Even now his is a name better known in the breach. On the evidence of the Three Books of Sonatas he got progressively less interesting. The first two books are certainly infused with Corellian novelty and lyricism. And whilst it would be quite wrong to say that the third Book lacks these qualities they certainly don�t exists in such profusion as the earlier collections. All conform to the four-movement sonata di chiesa plan. And all bear the unmistakeable stamp of Italian lyricism. Sometimes there are arresting things; try the expressive largo of the First Sonata or the occasional dissonances of the opening Adagio of the Fourth. Then again we have the flourishing and rhetorical panache of the Preludio that opens the (uniquely in this set) five-movement Eighth. Or the folk drones throughout, or the lightly elegant Allemanda of the Tenth Sonata, a sonata that features in its Gavotte the unlikely event of a harpsichord solo. These are all valuable features but for the main the sonatas show a far less personalised and less virtuosically entertaining profile than the first two books. This is not always a bad thing but it can limit contrast and colour. If I had to select a book it would be the 1710 but our appreciation and understanding of Senalli� can only be deepened by this exploration of the 1716 book � especially since this is by a long way the most complete account in the catalogues; isolated movements are all that exist elsewhere. 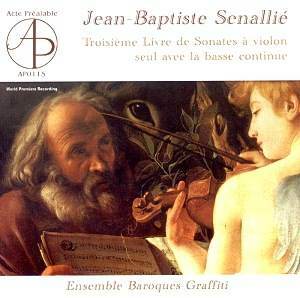 The Ensemble Baroques-Graffiti is an original instrument trio � violin (Jarosław Adamus) and harpsichord and cello. The violinist has an stringent and rather wiry tone which can be characteristically bulgy. The harpsichord continuo is absent for a number of these sonatas leaving the cello to support the violin, which it does adeptly. I can imagine someone like Manze investing these sonatas with greater fantasy and colour � also I suspect slower tempi. But not even he would convert them to the status of masterpieces.